WAPPINGERS FALLS, NY- The Hudson Valley Renegades clinched homefield advantage throughout the New York-Penn League playoffs as they blanked the Aberdeen Ironbirds 2-0 Saturday night at Dutchess Stadium. Three Renegades hurlers held Aberdeen to only three hits for the contest. 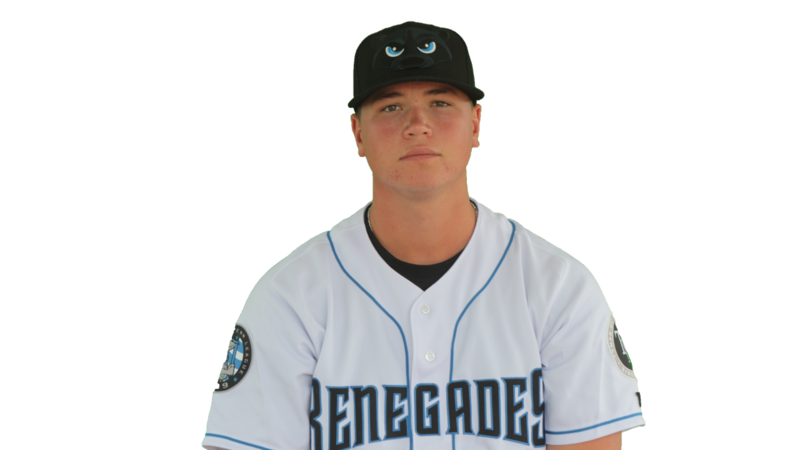 The Renegades plated their first run of the game in the fourth inning. With one out, catcher Erik Ostberg roped a double to left. First-baseman Allen Smoot followed that with a single to right to bring in Ostberg and make the score 1-0. Things stayed that way until the seventh when, with two out and nobody on base, leftfielder Bryce Brown drilled his second homerun of the season. It was a solo shot over the leftfield wall to give the Renegades a 2-0 lead. The Ironbirds, meanwhile, were kept quiet throughout the game as the Hudson Valley's pitching trio of Zack Trageton, Chris Muller, and Jack Labosky limited Aberdeen to three singles. Trageton (2-0) started the game and got the win for Hudson Valley after allowing only two hits and striking out four in five innings. He tossed 4.1 hitless innings before allowing back-to-back singles to catcher Cody Roberts and centerfielder Nick Horvath to put runners at first and second. However Trageton got the next batter, second-baseman Milton Ramos, to ground into a 6-3 double play to get out of the jam and end Aberdeen's best chance to score. From there, Muller and Labosky pitched two scoreless frames apiece to put the Ironbirds to bed. Labosky retired all six men he faced and struck out two to nail down his second save of the season. Hudson Valley managed only five hits, with no one registering more than one. The Renegades continue their three-game series with the Ironbirds tomorrow at 5:05. Hudson Valley will start right-hander Nick Padilla (3-5, 3.30 ERA) against a to-be-determined pitcher for Aberdeen. Tickets can be purchased online at hvrenegades.com or by calling the ticket office at 845-838-0094.